29. A. Haseltalab, M. Ayala Botto, R.R. Negenborn. On-board voltage regulation for all-electric DC ships. In Proceedings of the 11th IFAC Conference on Control Applications in Marine Systems, Robotics, and Vehicles (CAMS2018), Opatija, Croatia, pp. 341-347, September 2018. 28. R.D. Geertsma, R.R. Negenborn, K. Visser, J.J. Hopman. Pitch control for ships with diesel mechanical and hybrid propulsion: Modelling, validation and performance quantification. Applied Energy, vol. 206, pp. 1609-1631, 2017. 27. P. Velarde, J.M. Maestre, H. Ishii, R.R. Negenborn. Vulnerabilities in Lagrange-based distributed model predictive control. Optimal Control Applications and Methods, vol. 39, no. 2, pp. 602-621, March/April 2018. Available online: September 2017. 26. A. Haseltalab, R.R. Negenborn, G. Lodewijks. Multi-level predictive control for energy management of hybrid ships in the presence of uncertainty and environmental disturbances. In Proceedings of the 14th IFAC Symposium on Control in Transportation Systems (IFAC CTS 2016), Istanbul, Turkey, pp. 90-95, May 2016. 25. P. Mc Namara, R.R. Negenborn, B. De Schutter, G. Lightbody, S. McLoone. Distributed MPC for frequency regulation in multi-terminal HVDC grids. Control Engineering Practice, vol. 46, pp. 176-187, January 2016. 24. S. Roshany-Yamchi, M. Cychowski, R.R. Negenborn, B. De Schutter, K. Delaney, J. Connell. Kalman filter-based distributed predictive control of large-scale multi-rate systems: Application to power networks. IEEE Transactions on Control Systems Technology, vol. 21, no. 1, pp. 27-39, January 2013. 23. P. Mc Namara, R.R. Negenborn, B. De Schutter, G. Lightbody. Weight optimisation for iterative distributed model predictive control applied to power networks. Engineering Applications of Artificial Intelligence, vol. 26, no. 1, pp. 532-543, January 2013. 22. P. Mc Namara, R.R. Negenborn, B. De Schutter, G. Lightbody. Optimal coordination of a multiple HVDC link system using centralised and distributed control. IEEE Transactions on Control Systems Technology, vol. 21, no. 2, pp. 302-314, March 2013. 21. S. Roshany-Yamchi, R.R. Negenborn, M. Cychowski, B. De Schutter, J. Connell, K. Delaney. Distributed model predictive control and estimation of large-scale multi-rate systems. In Proceedings of the 18th IFAC World Congress (IFAC WC'11), Milano, Italy, pp. 416-422, August-September 2011. 20. P. Mc Namara, R.R. Negenborn, B. De Schutter, G. Lightbody. Coordination of a multiple link HVDC system using local communications based distributed model predictive control. In Proceedings of the 18th IFAC World Congress (IFAC WC'11), Milano, Italy, pp. 1558-1563, August-September 2011. 19. G. Bajracharya, T. Koltunowicz, R.R. Negenborn, D. Djairam, B. De Schutter, J.J. Smit. Optimization of asset management of transformers based on predictive health model of paper degradation. In Proceedings of the 17th International Symposium on High Voltage Engineering (ISH 2011), Hannover, Germany, August 2011. 18. M. Houwing, R.R. Negenborn, B. De Schutter. Demand response with micro-CHP systems. Proceedings of the IEEE, vol. 99, no. 1, pp. 200-213, January 2011. 17. G. Bajracharya, T. Koltunowicz, R.R. Negenborn, D. Djairam, B. De Schutter, J.J. Smit. Optimization of transformer loading based on hot-spot temperature using a predictive health model. In Proceedings of the 2010 International Conference on Condition Monitoring and Diagnosis (CMD 2010), Tokyo, Japan, pp. 914-917, September 2010. 16. R.R. Negenborn, G. Hug-Glanzmann, B. De Schutter, G. Andersson. A Novel Coordination Strategy for Multi-Agent Control using Overlapping Subnetworks with Application to Power Systems. In Efficient Modeling and Control of Large-Scale Systems (J. Mohammadpour, K.M. Grigoriadis, eds. ), Springer, Norwell, Massachusetts, pp. 251-278, 2010. 15. G. Bajracharya, T. Koltunowicz, R.R. Negenborn, Z. Papp, D. Djairam, B. De Schutter, J. J. Smit. Optimization of condition-based asset management using a predictive health model. In Proceedings of the 16th International Symposium on High Voltage Engineering (ISH 2009), Cape Town, South Africa, August 2009. 13. R.R. Negenborn, S. Leirens, B. De Schutter, J. Hellendoorn. Supervisory nonlinear MPC for emergency voltage control using pattern search. Control Engineering Practice, vol. 17, no. 7, pp. 841-848, July 2009. 10. G. Bajracharya, T. Koltunowicz, R.R. Negenborn, Z. Papp, D. Djairam, J.J. Smit, B. De Schutter. Optimization of maintenance of power system equipment based on a predictive health model. In Proceedings of the 2009 IEEE Bucharest PowerTech (PT 2009), Bucharest, Romania, June 2009. 9. S. Leirens, R.R. Negenborn. Prevention of Emergency Voltage Collapses in Electric Power Networks using Hybrid Predictive Control. In Intelligent Infrastructures (R.R. Negenborn, Z. Lukszo, H. Hellendoorn, eds. ), Springer, Dordrecht, The Netherlands, pp. 55-88, 2010. 8. M. Houwing, R.R. Negenborn, M.D. Ilic, B. De Schutter. Model predictive control of micro cogeneration fuel cell systems. In Proceedings of the 2009 IEEE International Conference on Networking, Sensing, and Control (ICNSC 2009), Okayama City, Japan, pp. 708-713, March 2009. 7. R.R. Negenborn, M. Houwing, B. De Schutter, J. Hellendoorn. Model predictive control for residential energy resources using a mixed-logical dynamic model. In Proceedings of the 2009 IEEE International Conference on Networking, Sensing, and Control (ICNSC 2009), Okayama City, Japan, pp. 702-707, March 2009. 6. M. Arnold, R.R. Negenborn, G. Andersson, B. De Schutter. Distributed control applied to combined electricity and natural gas infrastructures. In Proceedings of the International Conference on Infrastructure Systems 2008 (INFRA 2008), Rotterdam, The Netherlands, November 2008. 5. R.R. Negenborn, M. Houwing, B. De Schutter, J. Hellendoorn. Adaptive prediction model accuracy in the control of residential energy resources. In Proceedings of the 2008 IEEE Multi-conference on Systems and Control (MSC 2008), San Antonio, Texas, pp. 311-316, September 2008. 4. M. Houwing, R.R. Negenborn, B. De Schutter. 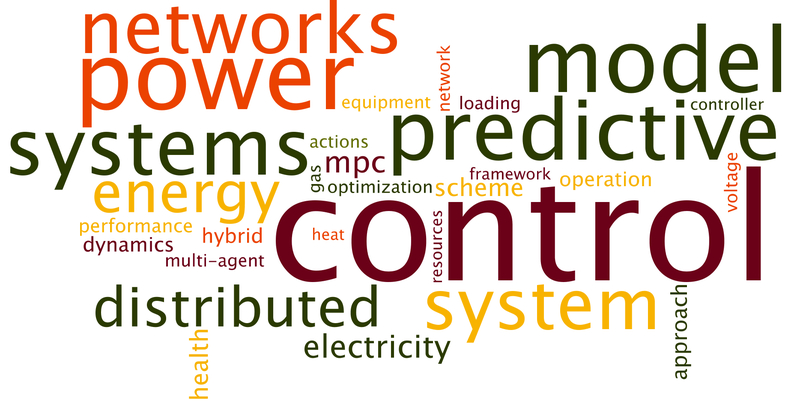 Economic advantages of applying model predictive control to distributed energy resources: The case of micro-CHP systems. In Proceedings of the 16th Mediterranean Conference on Systems and Automation (MED'08), Ajaccio, France, pp. 1550-1555, June 2008. 3. R.R. Negenborn, A.G. Beccuti, T. Demiray, S. Leirens, G. Damm, B. De Schutter, M. Morari. Supervisory hybrid model predictive control for voltage stability of power networks. In Proceedings of the American Control Conference 2007 (ACC 2007), New York, New York, pp. 5444-5449, July 2007. 2. M. Houwing, R.R. Negenborn, P. Heijnen, B. De Schutter, J. Hellendoorn. Least-cost model predictive control of residential energy resources when applying mCHP. In Proceedings of Power Tech 2007 (PT 2007), Lausanne, Switzerland, July 2007. 1. G. Glanzmann, R.R. Negenborn, G. Andersson, B. De Schutter, J. Hellendoorn. Multi-area control of overlapping areas in power systems for FACTS control. In Proceedings of Power Tech 2007 (PT 2007), Lausanne, Switzerland, July 2007.